It was yet another event but a different set of audience. It’s the Student Dev Event , an half a day that was held at MTC, Microsoft Signature Building, EGL, Domlur. I had the opportunity to present a session on the topic “Designing Universal Windows Platform App UI” during the event. 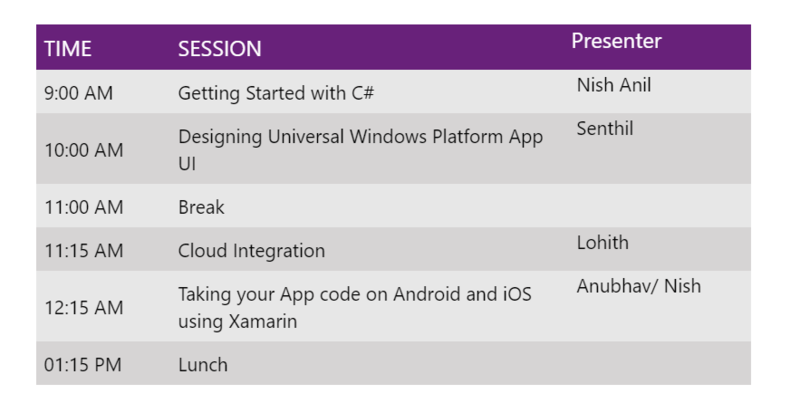 The session covered the basics of the UWP App development and how the developers can quickly get started with the UWP development as well as address the common challenges when building the app targeting the multiple devices. Here’s agenda that was covered in the event.